Thank you to everyone who left kind words about Spock either here, or on Facebook, Twitter or Instagram. They were greatly appreciated. 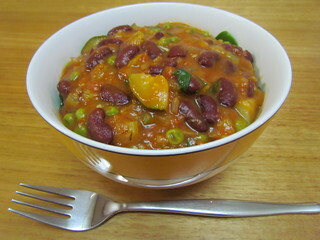 I've posted about how much I love Appetite For Reduction, so I was excited to get Quick and Easy Low-Cal Vegan Comfort Food by Alicia Simpson, figuring that it would be full of quick, fresh, low cal interpretations of favourite comforty foods. Not so much. In fact with many of the recipes I've made it seems to be fairly high-cal (I haven't made it yet, but the alfredo recipe has half a cup of oil in the sauce! ), but with teeny tiny serving sizes. This doesn't really work when you have a decent appetite! Also I don't really find this all that quick and easy, several recipes require ingredients that need to be pre-made. Oh well. I have still made some nice stuff from here. 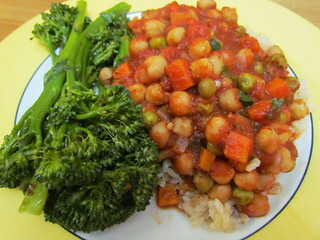 Chickpea Cacciatore with Sesame Broccolini: The cacciatore was fantatic, with a sauce full of all sorts of herbs. 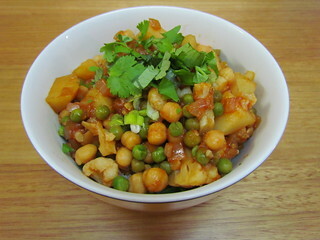 I used peas instead of capsicum, and there was also carrot and onion. I also added a few tablespoons of red wine that I had kicking around. This made about 4 servings, rather than 6. I used four small bunches of broccolini for the side dish, which are served with a sauce of sesame oil, balsamic, orange juice and Braggs, which gave 4 servings, rather than 6. Served over brown rice. 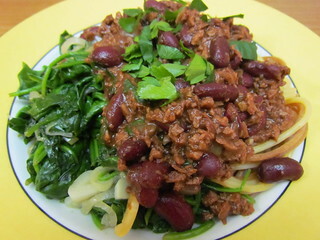 Cincinnati Chili and Five-Minute Garlic Spinach: This chili has TVP and kidney beans in it, as well as liquid smoke, cocoa powder and lots of seasonings. Traditionally served over spaghetti, this versions lacks the cheesy sauce that I have made in other recipes. I missed the cheesy sauce. I only used 8oz of spaghetti rather than one pound, so got 5 servings rather than 10, but if I had made it with the full amount of pasta there would have been a tiny amount of the chili itself for each servings. The spinach comes together very quickly. 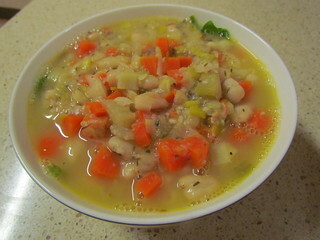 White Bean Cassoulet: This was nice, but lacked the flavour that I love in a cassoulet, Leeks, carrots, celery and white beans are the main parts of this. I got four servings out of this, rather than 6. 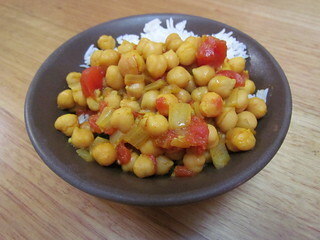 Indian-Spiced Chickpeas: This comes together very quickly, and is a bit bland in that tasty kind of wayI served this over basmati rice and baby spinach. 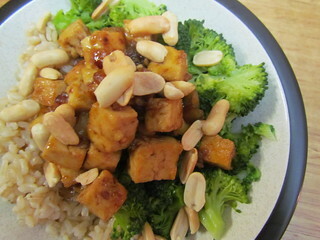 Kung Pao Tofu: I have come to very much enjoy kung pao tofu recipes, the sauce is just lovely, especially with the rice and broccoli to serve with it. I forgot to press the tofu, but it was still fine. I also pan-fried the tofu in a little peanut oil rather than bake roasting it in the oven for speediness. I got three and a half servings out of this, rather than 5. Chick'n Curry: This recipe calls for a defrosted package of MorningStar Farms Meal Starters Chick'n Strips, which we don't have here. Instead I used some Fry's Chicken Style Strips. I cooked the strips according to packet directions first, then followed the seasoning and baking directions, otherwise they end up with a strange texture. The was OK, though a bit bland. 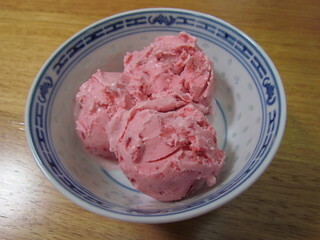 Strawberry Cheesecake Ice Cream: This simple ice cream has only five ingredients (including some Tofutti cream cheese), and has a lovely flavour. It is especially great with strawberry cupcakes, and makes a great sundae. 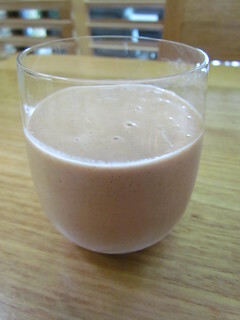 Pepita Smoothie: I was intrigued to try this raw pumpkin seed based smoothie. It said it makes two servings, but a half recipe made a very small serving! There is richness from the pepita, but the liquid is water, which left it with a faint watery aftertaste. I was expecting it to be green, but the mango and strawberry gave it a lovely pinkish hue. Everyone knows me as a cat lady, they know about my cats, how I work with cats and how I have my cats. 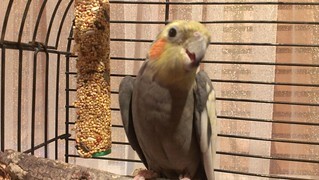 I also have a bird, a cockatiel named Spock (after Star Trek). 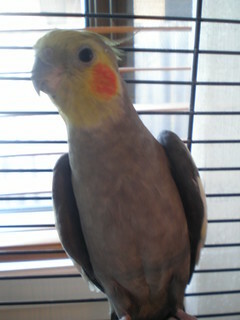 Only now I must say that I had a bird. 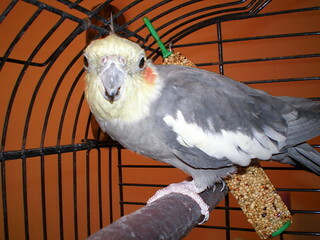 Yesterday evening little Spock departed this world after 21 years. 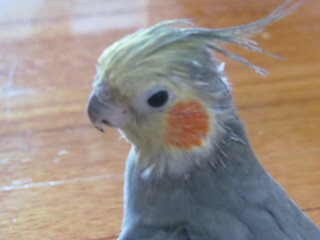 Spock stayed home in Brisbane while I was studying my first degree in Wagga Wagga, but after I moved to Sydney for vet school he flew on a plane down to come and live with me, Dim Sim and Gizmo. He was able to come out and sit on my shoulder and walk around without any grief from those two (always under strict supervision, of course! ), but once I got Sahara that had to change. Sahara is a natural hunter, and one of her first activities when she got home was to jump up on his cage and bring everything down! So he didn't get out very much anymore while she was around. With less coming out, he became less willing to be handled, but still enjoyed being whistled to. I tried to buy him toys, but he mostly refused them, except for the mirror I bought him a few years ago. He loved looking at himself in that mirror. 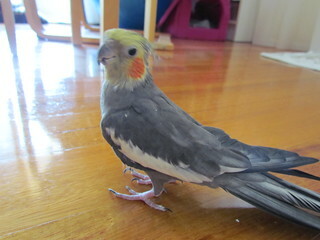 He escaped and flew away once while I was in Sydney. He was out overnight, and I spent the entire afternoon and following morning putting up posters around the neighbourhood and doing letterbox drops. Miraculously, I got a call from someone to say that had found him in their yard. They had three cats and two dogs, but thankfully were home off work that day and noticed him sitting there, looking rather confused. My feelings about having Spock were somewhat complex. 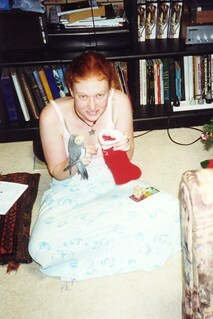 Obviously in my journey from a 12 year old to a 33 year old vegan and animal rights advocate, keeping a bird caged began to not sit well, especially in a house with cats which further limited his ability to be out and about. But done is done, so I tried my best. With work and my pre-occupation with the cats, I know it wasn't enough. I have a lot of guilt over much of his life. 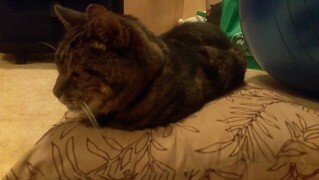 Last week Spock turned 21 years old. Apparently that is quite impressive in cockatiel circles. Yesterday morning I said goodbye to him before I went to work, he was sitting in front of his mirror looking a little hunched, but nothing too out of the ordinary. I came home from work and was getting dinner started, and my mum went to close the blinds on his window and found that he had passed away. I hate that we didn't know, that he was on his own when he went. I hope he wasn't scared. I hope it was peaceful. Here are some photos of this little man. You will note in the first one, taken back in 1994, he looks very different. 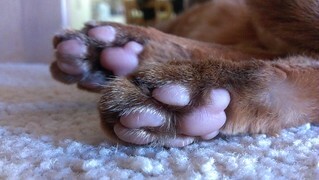 That was when he had his pearly markings, turns out that they often change to regular grey after a year or two! But I didn't mind. The last photo was taken just last week, on his 21st birthday. 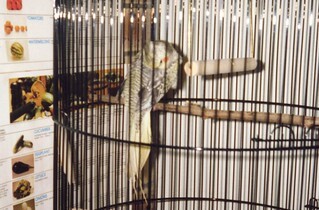 There will be no more birds for me, and I will be donating his cage to a wildlife rescue for temporary housing of rescued birds. I know it was not an ideal life, but he seemed to find joy in many things and I hope that was the case. He can now fly free in little bird heaven. Goodbye my handsome little one. Some more from One Dish Vegan! 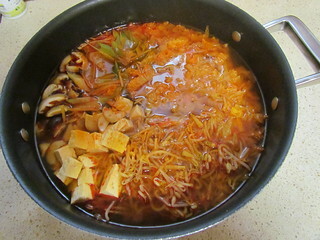 Korean Hot Pot: Wombok, carrot, shiitakes, tofu, scallions, enoki mushrooms, bean sprouts and ginger are cooked in a yummy broth and served over hot rice. It is as good as it sounds. 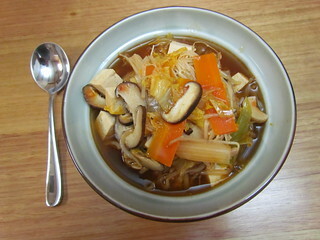 Everyone serves themselves from the pot, and the remaining broth can be served in small cups or bowls (though I ended up putting some back over my food in the bowl as well). 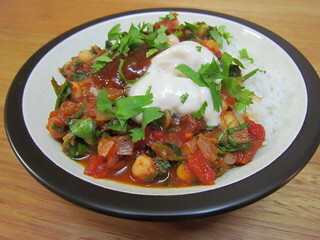 Vegetable Etouffee: Based on a Cajun stew, I shameless ignored the so called 'trinity' of vegetables and ditched the capsicum in favour of extra celery in peas. 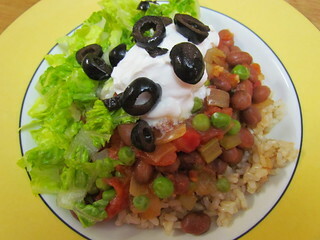 Kidney beans, tomatoes and seasonings make this a tasty dinner, served over brown rice. 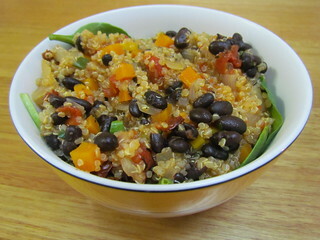 Black Bean and Two-Tomato Stew with Quinoa: Fire-roasted tomatoes and sun-dried tomatoes are the two tomatoes here. I left out the red capsicum in favour of some diced carrot. 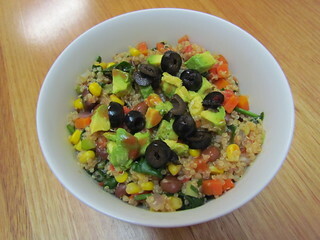 This was yummy, but from a visual perspective next time I would make it with red, rather than white, quinoa. For some reason I was expecting it to look a lot redder! I got 3.5 serves out of this. Hot Salsa Pinto Beans and Rice: I made these not so hot by decreasing the chili, and I also used peas instead of capsicum. Served over brown rice, this was like a fun burrito bowl. Especially food with the crunchy lettuce and sour cream. 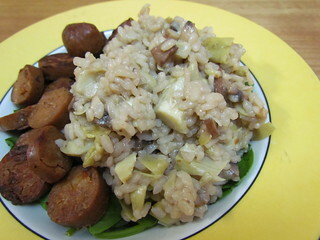 Risotto with Artichokes and Mushrooms: I love making risotto, I find the stirring very zen. I used a whole 200g box of mushrooms (rather than 4 ounces) and a whole tin of artichoke hearts (rather than just a cup), so I didn't have left over bits and pieces and because I like a high stuff to rice ratio. The recipe calls for 4 cups of broth, though says you may not need all of it, but I did. I served this over spinach and with some Tofurkey Chicken and Apple Sausages. 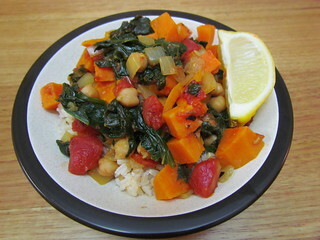 Tunisian Chickpeas with Sweet Potatoes and Greens: This is satisfying, and served over brown rice gave four good sized servings. There is an option of the greens to use, and I used chopped English spinach (as opposed to kale or silverbeet). 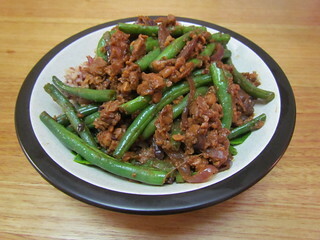 Szechwan Tempeh and Green Beans: This is so delicious, even my tempeh suspicious father enjoyed it. I used a 300g packet of tempeh, rather than 250g, so I used the larger Australian tablespoons to mix up the sauce of the tempeh to make sure there was plenty to go around. 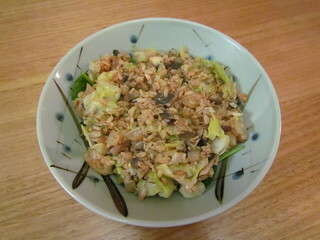 The tempeh was salty, but there was also a sweetness and freshness from the beans. Served over rice. I got about three serves out of this, rather than four. You will want to eat it all! One-Pot Cheesy Mac: This was one very saucy pasta dish! 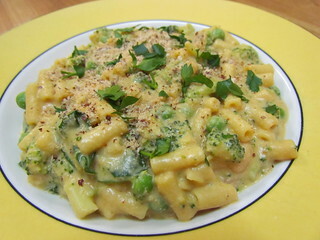 I used 250g of pasta (tube macaroni, I couldn't find elbow macaroni), and I only had enough for 2 cups of broccoli (rather than 3), so I filled it up with peas and spinach. It is a pretty tasty little mac and cheese, with cashews and white beans in the sauce. I used the leftover beans from the tin to add to the rest of the pasta as well. 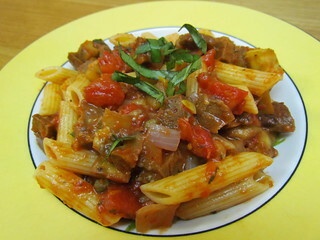 Ziti with Sicilian-Style Tomato Sauce: Sometimes I can always find ziti in the supermarket, so I use penne instead. This sauce has onion, eggplant, tomatoes, lots of garlic and capers. Also capsicum, but I just left that out. I also added in the option chopped sausages, using the homemade sausages from Isa Does It. I found this was lacking a complex flavour, it just needed a little something extra, but I am not sure what. 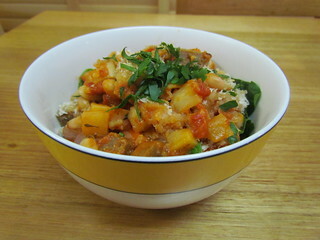 White Bean Cassoulet: I love cassoulet, and this recipe did not disappoint. Red onion, carrots, parsnips, white beans and sausages (optional, but as if you would leave them out - I used the ones from Isa Does It) make one heck of a delicious dinner, that smells amazing in the oven. 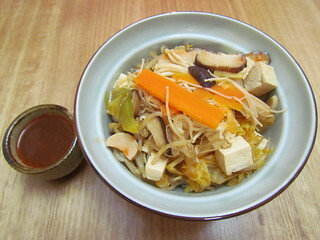 The sauce involves some miso, which is always a good thing in my book! I used panko breadcrumbs for topping. Dim Sim is waiting for her water bowl to be filled up (even if I have just filled it, she demands it be filled fresh to the top every time she wants a drink! 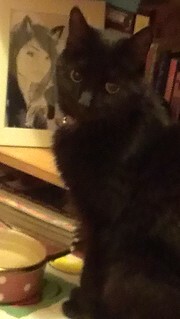 ), and she has posed herself right in front of one of my Maryanne Oliver prints, her little face is actually over the face of the black cat in the print, super cute. More Quick-Fix Vegan has been an amazing book with my often busy days. While I do love spending time in the kitchen putting together complicated recipes, sometimes you just need something that can be out on the table with minimum fuss, but that doesn't compromise on yumminess. Balti Bowls: I love balti curry, so this was high up on my list to try. There is an option of seitan, tofu, chickpeas or soy curls, and I used chickpeas because that was what I had easily to hand. It says to use 2 cups, I used one 400g tin which is about 1 1/2 cups, and I got just over 3 servings. I served over basmati rice rather than with naan, because I couldn't find any vegan naan and I didn't feel like making any. 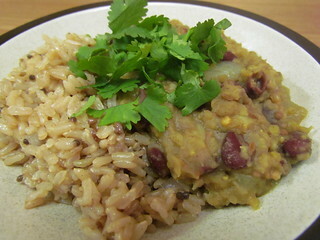 If you have any leftovers they are great mixed with some rice and peas! 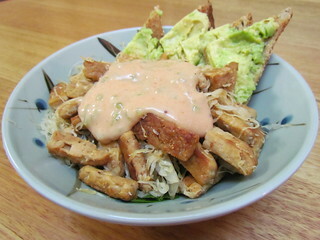 Tempeh Reuben Bowls: To my knowledge I had never had a reuben before I went vegan, and I have really only just recently started exploring the many recipes in my books! I made a half batch of this recipe (though I made the whole amount of the sauce), which gave me just over a single dinner, so I guess I like my reuben bowls pretty hearty. I couldn't find pumpernickel bread anywhere, so I just used some rye for the toast triangles, and I spread avocado on them because why would I not. I also served this over spinach and with potato wedges and a dill pickle on the side. 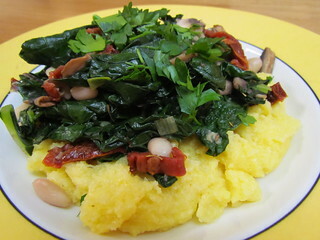 Polenta with Tuscan Kale and Cremini Mushrooms: I always forget how much I love polenta, and then I eat it again and become obsessed with its creamy deliciousness. I much prefer the curly kale to Tuscan kale, but I enjoyed the Tuscan in this dish. Though I needed to buy three bunches of Tuscan kale to get enough, which was a little on the pricey side! But a very satisfying dinner. 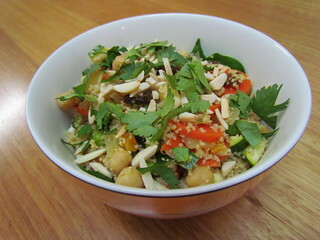 Manchurian Chickpea Bowls: I have never had Manchurian cauliflower, which this dish is based on, but I agree with Robin's assessment of the flavour - it is indeed intoxicatingly delicious. This has potatoes in it as well, but I served it over rice anyway because I love all the carbs. Also over some baby spinach for greens. Mexi-Cali Quinoa Bowls with Pintos and Corn: This has some really satisfying flavours - quinoa, corn, tomato, spinach, pinto beans and avocado. I also subbed chopped carrot for capiscum. Yum. I also added black olives, at Robin's suggestion, then topped it with nooch (my suggestion, I love nooch). Served over more spinach. General Tso's Tofu: I have only ever once ordered any sort of Tso's, which was the vegan Tso's chicken at Bamboo Garden in Seattle, and I was a little horrified by the deep-fried of it all. This pan-fried tofu is much more on my level, and doused with a sticky sauce. The sauce is quite sweet. It says to use 14-16 ounces of tofu. I used a 375g block, which made 3 big servings. 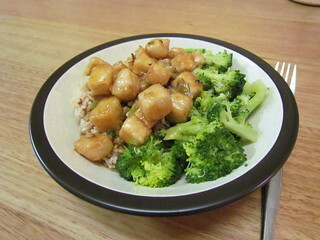 Served with brown rice and broccoli. Fiery Korean Stir-Fry: Fiery does not sound like my kind of fun, but I turned this into a not-so-fiery dish, and I loved it. I used the suggestion of using some gochujang rather than chilli because there was some in the fridge. I used 1 teaspoon, and it was the right amount. Moroccan Bistilla Pilaf: I have never made an actual bistilla because filo pasty is not my favourite and I am deeply suspicious of any main dish that has icing sugar sprinkled on top. This pilaf gives me the fun flavours without the fuss or suspicious sugar. Even though it has apricots and raisins, it is not too sweet, and and the almonds add a perfect crunch. Over baby spinach gave me three and a half serves. Unstuffed Cabbage: Stuffed cabbage is another thing I haven't made, I will one day when I have time. But this quick version apparently gives all the flavour with minimum time. 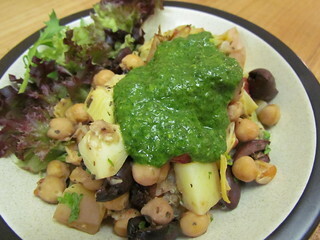 I used sugarloaf cabbage here as I couldn't get regular green. I actually would have liked a bit more cabbage! 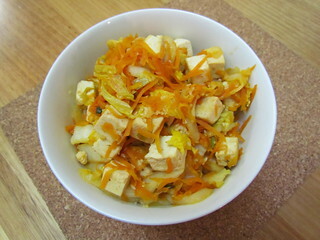 It gives the option of using TVP, crumbled tofu, chopped seitan or chopped tempeh, and I used TVP. 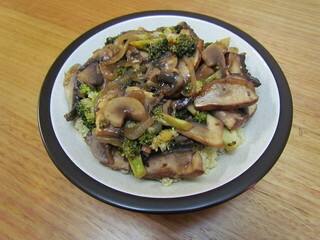 Spicy Ginger-Lime Portobellos and Broccoli: I served this over quinoa, and really only got three servings out of the recipe. I had bought two bags of smaller portobellos at the markets (I couldn't find big ones), but the second one ended up being just regular white mushrooms. So annoyed! But it was still good. 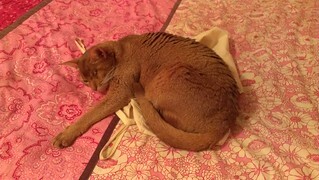 Sahara sleeping on the laundry bag I left lying on the bed. Because any extra layer that you can get underneath yourself will greatly improve your comfort. I had a few days off the computer, but here I am again with another recipe round-up. Dreena Burton writes some great recipes, so I was excited when her newest (but not for long, she has a new book on the way) book Let Them Eat Vegan came out. This book has a slant towards wholefoods and family-friendly recipes. 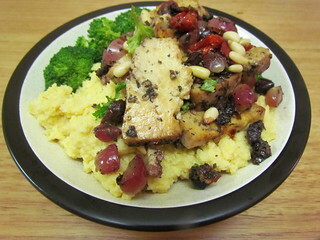 Tofu Backed in an Olive, Grape, and Herbed Marinade and Creamy Polenta: This tofu dish intrigued me with the flavour combination. I am a bit iffy about grapes in cooked savoury dishes, but they added a nice sweetness with the salty olives. The polenta is creamy and satisfying and makes a good base for the stronger flavours of the other dish. 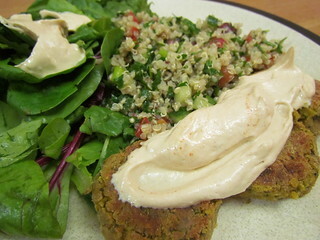 Panfried Falafel Patties with Smoky Spiked Tahini Sauce and Quinoa Tabbouleh with Olives: This was a fun dinner. The patty mixture was very thick, and needed several minutes in the food processor. It formed quite a soft patty mix, though held together well. The tahini sauce is outstanding, you could drink it! The salad is a great, refreshing side, that would be good on its own for lunches as well. Chickpea and Artichoke "Bliss in a Dish" with Basil Lemon Pistou: I think this was the first thing I made from this book. I increased the amount of tomato to replace the capsicum. It was a lovely mix of flavours, including sultanas that added a nice touch. The Pistou was a ovely, bright and fresh topping (though the recipe only makes a small amount). Leftovers make an excellent salad mixed with some cold quinoa and left over greens. 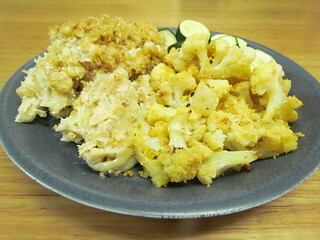 Mac-Oh-Geez and Almond Roasted Cauliflower: This is a nooch free mac dish (what? ), that is very filling and quite good, though I missed the cheeziness. The sauce is a bit bland, but does have a nice tang. It also thickens up quite quickly, so keep an eye on it so you don't end up with glug. The cauliflower is delicious, though sadly makes pretty small servings. Dreena was not lying when she said 'maybe just 1' in the serving sizes! The cauliflower is coated in ground almonds and nooch - amazing. 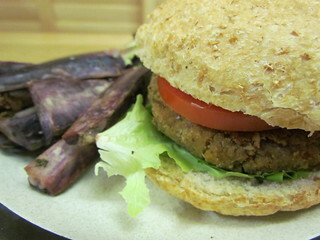 Nutty Veggie Burgers with Sunshine Fries with Rosemary and Coarse Sea Salt: These burgers are a mix of almonds, walnuts and pecans as well as carrot and zucchini, and they hold together very well. They are great on a bun with all the burger fixings! Burgers need fries, of course. My 'sunshine' fries were more like 'stormy fries', because I thought I had found some yellow (rather than orange) sweet potatoes but it turned out that they were actually purple on the inside. Still good! Fragrant Kidney Bean Lentil Dal and Indian-Inspired Rice: Dal is one of my comfort foods, and this is a smooth, mushy, delicious bowl of comfort. The brown rice side is lightly spiced with mustard, cumin, cardamom, coriander and cinnamon, making it a great accompaniment. 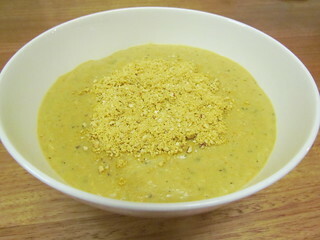 Kids' Cheesy Chickpea and White Bean Soup with Cheesy Sprinkle: Smooth and cheesy is why this soup is designed for kids, but it will be enjoyed by just about anyone - it is delicious! Made even better with some easy cheese sprinkle made from nooch, cashews and almonds. Underneath all of this soupy and cheesy goodness is a mound of sauteed kale. 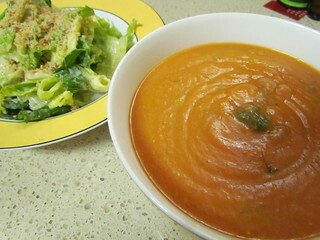 Tomato Lentil Soup with Cumin and Fresh Dill and Classic Caesar Dressing on salad with Brazil Nut Parmesan: A huge pot of tomato lentil soup is a very satisfying thing to have bubbling along on the stove. Served with salad, it is a great dinner. Crisp lettuce leaves are the perfect vessel for the caesar dressing. While the list of ingredients is quite long, it is worth it. The parmesan does take a bit of time - it requires a baking step and cooling - so make it in advance. I only made a 1/3 batch of this and it made heaps. 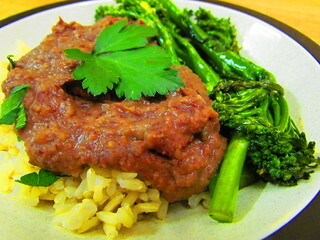 Wonder Bean Puree and Gingered Broccolini: A simple but very satisfying dinner, served over brown rice. The bean puree is well seasoned, though really only made three serves (not 4-5 as stated in the book), and even a double batch of the broccolini only made enough for 3 servings as well. It would have made good leftovers! 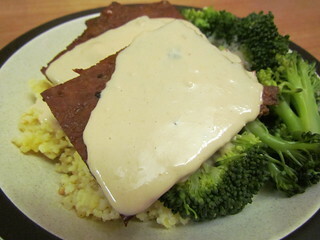 Tempeh Tickle with Peanut Tahini Sauce: This is some great tempeh - juicy, tasty slices of goodness. It could make a great addition to any number of dinners, not mention a yummy sandwich filling! Doused in some drinkable Peanut Tahini Sauce, this is a great combination. 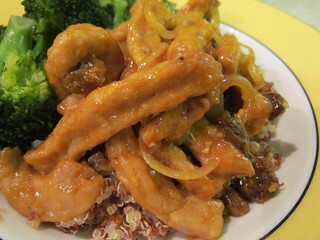 Brown rice and broccoli were the perfect to let the tempeh and sauce flavours really shine! Our beautiful family boy Possum, he liked sitting on cushions. It would have been his 20th birthday a couple of months ago. We all miss him very much.